Take a trip to OTR to discover the Clay St. Press, Inc. Located at 1312 Clay St., a back street. The Press door opens into a small gallery with a press room located behind it. Owner and director Mark Patsfall originally had a shop in St. Bernard in the early 1980’s, but eventually moved to a location one and a half blocks from Old Saint Mary’s Church in 1986, virtually across the street from The Art Academy of Cincinnati on Jackson St.
“We are one of the few fine art presses in this part of the country that has worked with local, national and international artists,” said Patsfall. Patsfall purchased the building for a modest amount. He specializes in creating a small edition of hand-pulled prints in a number of print mediums including lithography, etching, woodcut, and silk screen. Since 1981, he has offered a variety of prints for sale featuring artists of all styles. To augment his press business, he opened a gallery in 2004. The gallery exhibited prints by Andrew Au, associate professor of printmaking at Miami University, from March 11 until April 22, 2017. Patsfall received a grant from Miami University to create a suite of prints for this exhibition. Art Children in 3-D is an exhibit which ran from April 28 to May 20, 2017. It was a collaborative showing of current students and 2017 graduates working in sculpture from the MFA programs at DAAP at the University of Cincinnati and Ohio State University. The exhibition offered present and future currents of sculpture, mixing the realms of 2-D and 3-D, moving image and static form, sound and the ocular, and interactive and intangible. The real work of the Clay St. Press is done in the back room. There are two etching presses and a lithopress. Patsfall concentrates on original prints, even though it is a small market. Most of his customers are local artists. One major project was the Jim Dine portfolio done for the Cincinnati Art Museum in 2009. Other artists with whom he has worked include Richard Biting, Jay Bolotin and Chunwoo Nam. Patsfall has acted as publisher, co-publisher and contract publisher. Early in his career, Patsfall worked on international and national projects with such people as Cincinnati gallery owner Carl Solway. Over twenty years ago, a Text and Signifier exhibition explored the uses of texts and signs. The exhibit was a selection of editions published by Patsfall Graphics, Carl Solway and Volatile Editions. Patsfall used to teach printmaking at UC’s Design, Art, Architecture and Planning College as an adjunct professor. Another local press is the Tiger Lily Press founded in 1979 and located on the lower level of an old schoolhouse behind the Dunham Recreation Center in Price Hill. The Cincinnati Recreation Commission supports the Press by renting the space at below market rate and paying for utilities. For a modest annual fee, members can use the work space, take advantage of exhibition opportunities, attend classes at a reduced fee and enjoy the camaraderie of area printmakers. Classes include etching, calligraphy, printmaking, polyester plate lithography, monoprint, letterpress, relief, silk screening, papermaking and printing. Teachers are artists with expertise in one or more of the printmaking processes. Four to six instructors, such as Nancy Turner, Andrea Knarr and Rick Finn, teach during either the spring/summer or fall/winter sessions. 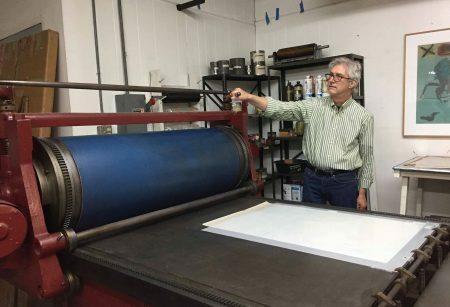 Carole Winters, a member of the Board of Directors and media contact, said membership is a bargain for local printmakers. Approximately 40 people have joined TLP. All members have to volunteer four hours annually at the studio. The Press also provides members opportunities to exhibit their work with shows and a print sale as well as to appear in a calendar designed to raise funds. TLP offers an open studio on Tuesday nights, Friday afternoons, Saturday afternoons and second Sunday afternoons for members to work. Equipment includes three etching presses, a gallery proof press with letterpress type and equipment, a 4’ x 5’ exposure unit for screen printing and a t-shirt printer, all available for members’ use. A studio monitor joins the group for technical assistance. Friends of Tiger Lily Press can join at substantially reduced rates. Their benefits include everything but working in the studio. 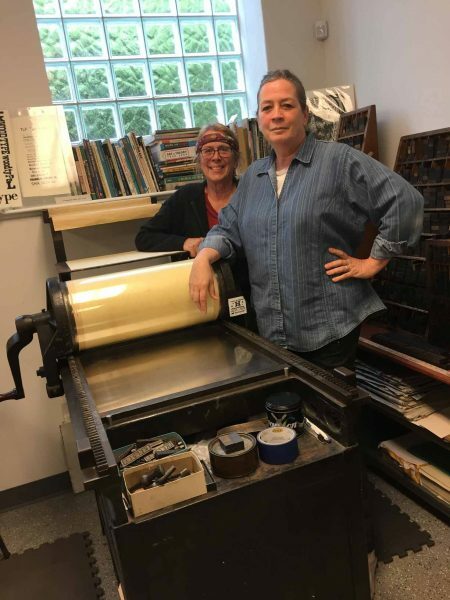 Board president and studio manager Susan Naylor manages the overall organization with the assistance of a working board of directors and volunteers who have years of experience in printmaking. 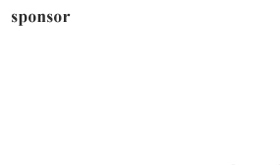 Nine members, who are all professional artists and printmakers, serve on the board. They include April Foster, a retired printmaking professor from the Art Academy of Cincinnati, Jan Torrance Thomas, a retired art teacher from Oak Hills High School, and Jonpaul Smith, an artist who received his MFA from DAAP in 2005. TLP received tax-exempt status under 501 c (3) of the US International Revenue Code on December 3, 2016. This enabled the Press to apply for government and foundation grants which will further its mission to produce, preserve and promote the art of printmaking. “TLP is now an official arts organization in the City of Cincinnati with the ability to acquire funds to build programming, produce events and achieve the dream of having a full-time director and staff,” said Naylor. She said there is a move afoot to create an arts program in this area. Naylor traces her involvement with TLP to 1982. She served as director from 1993 – 1998. Ten years later, she returned first as a studio manager, then a director. Tiger Lily Press also offers a Working Artist Residency established in 2012. The program is designed to assist a local artist who is committed to the work and the artistic community. Brad Thiele, who received his MFA from California State University, Chico, won the 2017 award. He is taking a cross country bike tour. Upon his return, Thiele plans to produce an artist’s book chronicling the tour using letterpress and other printmaking techniques. He will also teach a class. An upcoming event in which TLP is participating is a Printer Faire on Saturday, June 17 from 10 a.m. to 5 p.m. at the Hellman Creative Center in Covington, Kentucky. Designed to be an interactive fair, attendees can participate by making prints in workshops, observe professional printmakers making prints and purchase prints from printmakers. The annual print sale is November 4 at the Clifton Cultural Arts Center in its last year at that location. TLP was founded in 1979 when it began at the YWCA Women’s Art Center. It moved to loft space at 4th and Plum Sts. in 1982. TLP made its home at the Art Academy of Cincinnati from 1985 to 1998. The Alumni Association of the Art Academy donated TLP to the Cincinnati Recreation Commission in 1998. It eventually ended up on the campus of Dunham Recreation Center in September 2000. In 2011, the CRC renovated the schoolhouse, which was in disarray. www.tigerlilypress.org Studio location: 4356 Dunham Lane, Cincinnati, OH 45238. For more information, contact tigerlilypressstudio@gmail.com.